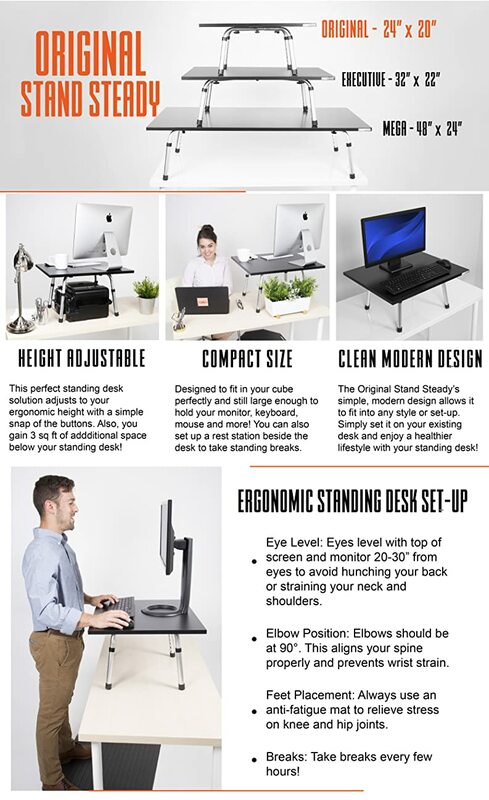 The Original Stand Steady Height-Adjustable Standing Desk Converter is comfortable, affordable, and compatible with your existing desk or tabletop. Simply place The Stand Steady adjustable desk riser on any flat surface, set it to your height, and you are ready to work standing up. The medium-sized surface is plenty large to hold your monitor, keyboard, mouse, and coffee. Best of all, it actually increases your usable desktop space by over three square feet because you can stow items beneath the raised platform! It's the quickest, easiest, and most cost effective way to stand up for your health and productivity! Watch the Product Video. Click here. 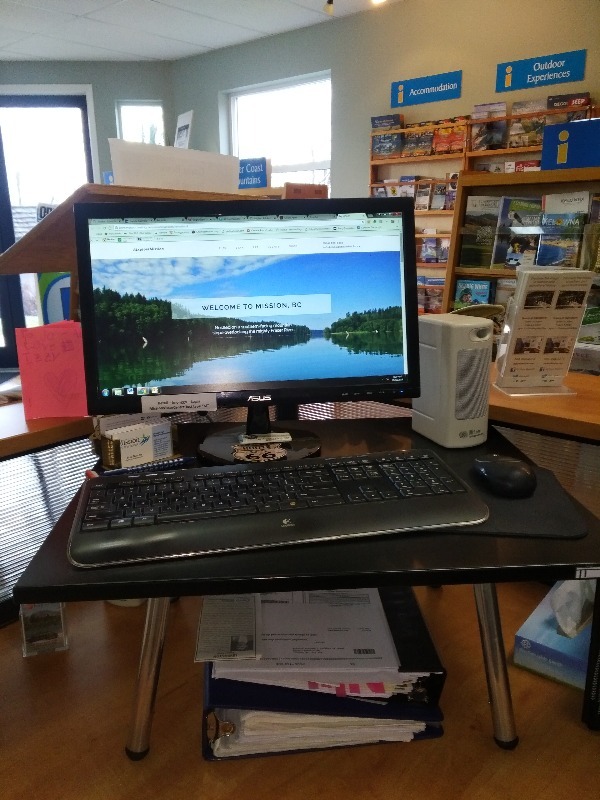 LARGE ERGONOMIC SURFACE: Measuring 24 x 20” (approximately three square feet), the sit stand desk converter can be set at a positive or negative tilt for a more personalized fit and better typing comfort. It’s also large enough to fit your monitor, keyboard, mouse, snacks, your collection of bobble heads, and more! Why overspend on those fancy ones? This mini desk stand is perfect for existing desks or tables. It is lightweight yet sturdy and has multiple height settings. Why would you spend hundreds of dollars on those other ones that are heavy. This unit can be easily moved from table to desk throughout your house. I use it at my desk with a 15 1/2 inch laptop and mouse pad, and it's a perfect fit. With quality hardware, assembly was a no-brainer. It's stable as a rock, without even a hint of wobble or jiggle. A big plus is the free space under the platform. That's one of the reasons I opted for this design rather than the ubiquitous scissor construction. The Stand Steady Original Standing Desk 23.5 x 20 works well for what I wanted. I am barely over 5 ft tall so I have it on the shortest leg setting. I have my laptop and mouse on it and there is plenty of room. I can easily take my laptop off, remove the stand, and use the desk again when I want to sit down. The plastic screws that attach the legs seem a little cheap and could easily break or strip the threads if tightened too much, so in that respect it seemed a little overpriced. However, I am glad I bought it. It was in good condition and very easy to assemble: five screws with large heads. I was looking for a sturdy economical standing desk option...I love this one. I have had all kind of standing desks over the years and this is a top. I keep my computer and all my accessories on an upside down long wood picture frame so it's easy to move on and off! VERY NICE FEELING TO HAVE THE CHOICE OF SITTING OR STANDING WHILE WORKING WITH YOUR DESKTOP.